Coorg is popularly known as Kodagu. The name derived from Kodimalenad which means dense forest lands on steep hills. Coorg is the anglicized form of Kodagu, though it is called and written in Karnataka by its original name `Kodagu. This district lies on the summits of the Eastern and the Western slopes of Western Ghats. It is bounded on the North by Hassan District, on the East by Mysore District, on the West by South Canara District, and on the South by the Cannanore District of Kerala State. Coorg is the smallest district in Karnataka State and in population also it is the lowest. The area of the District is 1590 Sq Miles or 4118 Sq KMs. The historical period of Kodagu begins from about 2nd Century AD. But as in the case of almost every place in India, Kodagu also had a legendary period before its history begins. The District has a mountainous configuration which presents a grand panorama of verdant valleys, ravines, fast and luring streams, lofty peaks and awe-inspiring spurs. The splendour of Kodagu, the picturesque view of the land with its beautiful green sward and varied foliage, grassy or forest clad hills, behold the eye of every stranger who has an aesthetic mind to enjoy the beauty of nature. The people of Kodagu comprise of all religious faith, caste, creed, community and tribes, but the most ancient among them are Kodavas and those speak Kodava Language. Kodavas have a unique culture uncommon to others. Among various communities in India, the Kodavas have perhaps most clearly evidenced the impact of change during the past 200 years. Considered to be a microscopic community, the analytical unit provides a link between social and economic change and political life, between structural change in society and political sentiments and behavior. The Kodavas have had a turbulent and colourful history. Their efforts to safeguard their land assumed dramatic forms in a series of escalating confrontations with the rulers of neighbouring countries. These confrontations and adaptations provide rich material for an analysis of a political and cultural life of a community in change. In complexity and range of problems involved in the relationship of caste to Indian political life have elicited an extensive literature in recent years. Social scientists and historians have made impressive contributions both to the descriptive knowledge and most importantly to the theoretical understanding of the interaction between society and political system. Non-literacy has been a severe handicap to many primitive people and this applies to the Kodavas also in respect to their past history. Though the Kodavas are today one of the most literate of the communities, the position was rather backward two centuries back. As such there is no reliable written material to shed light regarding the past. This has been a major handicap to anthropology as well as to any scientific study regarding them. It was within the land of Coorg, the Kodavas traditionally made their home drawing life from cultivation. The land was fertile and life was happy. The traditional account of the origin of the Kodavas is little known today among the community. But the Kodavas are said to be a distinguished community belonging to the highest cadre in the anthropological scale. In the ranking of castes in the south, the Brahmins by tradition and sanction, occupied in supreme position in the hierarchy of ritual purity. But anthropologists like Sir.Eriskine Perry and others point out that the Kodavas have no resemblance to any of the races of South India and they are by far the finest race they had seen in India in point of independent bearing, good looks and all outward signs of wellbeing. As years rolled, Kodavas migrated into other parts of India, climbing the echelons of higher education and employment. Bangalore, being the capital of Karnataka, was the priority hub. As years rolled Kodavas migrated into other parts of India from Kodagu mainly for higher education and employment. Especially after re-organization of States Kodagu become part of Karnataka. Bangalore being the Capital of Karnataka offered better education facilities and employment. Therefore majority of Kodavas started settling down in Bangalore. As is the practice, like any other community, Kodavas decided to come together and form a social network. Accordingly Coorg Association was established in the year 1911. This Association had only 15 members and year after year the number of Kodavas increased in Bangalore. The Coorg Association was renamed as Kodava Samaja, Bangalore. In the initial days the Samaja functioned from private houses or some public places. In the year 1959 the Maharaja of Mysore donated 1 acre of land to Kodava Samaja through our great soldier Late Field Marshal Kodandera M Cariappa to whom this land was to be given. The broad minded Cariappajja decided to hand it over to Kodava Samaja, Bangalore which was registered in the year 1961 at Vasanthanagar, Bangalore from where the present Kodava Samaja functions. As you all know, Kodava Samaja, Bangalore is a mother body and has a great history indeed. Today Bangalore Kodava Samaja has a Royal standing beckoning the Kodavas world over. The multifarious activities handled by Kodava Samaja, Bangalore is known all over and proudly Kodavas call Kodava Samaja, Bangalore their Aiynemane. The spontaneous assistance available to Kodavas at times of tragedy and illness, is appreciated all over. 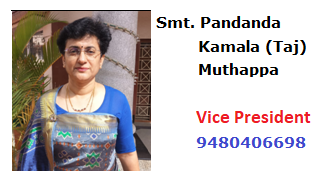 The meritorious students are indentified in the field of education with scholarships/freeships and awards to those toppers in various examinations are some of the significant activities of Kodava Samaja. The Employment Cell situated in Kodava Samaja has programmes for training, placements and personnel developments which are absolutely necessary in these days of competitive living. Kodava Samaja makes no secret of their efforts to uplift the poor Kodavas, Senior Citizens and the deserving youth in all respects. The expansion programmes in the field of education, health and infrastructure development are on the priority list. The Cauvery School and the College are rendering yeoman service in the field of education and the Kodava Samaja has been at their back to maintain excellence in every activity of the Institution. Bangalore kodava samaja has completed its 100th year of existence in 2011. The beginning of the present kodava samaja is traced to the year 1911. It was in this year , that eight kodava families of Bangalore comprising of just about 30 people came together and formed an association and named it as Coorg Association. Two prominent kodavas of the town then, shri Kodanda. A. Nanjappa and shri Kuppanda Mudappa, D.F.O played a key role in the formation of the Coorg Association. The celebration of Kailpodu festival at the residence of shri Kodanda Nanjappa in September 1911 is regarded as the first meeting of Coorg Association. Shri Kodanda .A.Nanjappa and shri Kodanda .A Machaiah, between themselves managed the affairs of Coorg Association from 1911 to 1941, with the active support from other members. The name of Coorg Association of Bangalore was christened as Bangalore Kodava Samaja in the year 1962. Bangalore Kodava Samajas journey towards its 100th year is full of ups and downs and trials and tribulations. It has withstood all the problems and challenges over the past decades and has become strong and solid today. The kodavas of Bangalore from all walks of life, the rich and the poor have all contributed their mite for the rise and growth of the Samaja. A few kodavas have made immense contributions in many different ways to the samaja. Many developmental works and activities have taken place during the tenures of the above presidents and their respective teams. A small effort is made here to trace and highlight the major developmental work and activity of the Bangalore Kodava Samaja during the last 100 years in a chronological order. (1) Kodava families staying in Bangalore come together and form Coorg Association. A small committee came into being to collect donations from all the families of the association. From this year Kailpodu festival was celebrated at prominent public places like Lalbagh, cubbon Park and YMCA hall, instead of celebrating it in the residences of a few kodavas. Both the Associations got merged, by setting aside their differences. The Reorganization of States and the incorporation of Coorg State with Mysore state saw a large influx of kodavas to Bangalore. 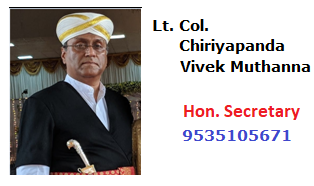 (3) Rao Bahadur Pemmanda .K.Monnappa(IGP of Mysore State Police)then, was the president of the Coorg Association. 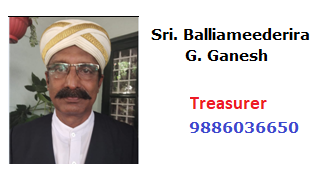 He played a key role in land transfer to the Association. Coorg Association was named as Bangalore Kodava Samaja and Registered under the Mysore State Societies Act, 1960. Community Hall construction work in full swing. Members of the Samaja collect donations facing lot of hardship from kodavas of Bangalore, Mysore, Coorg and other places. (2) First Kodava Marriage takes place in the Hall on 15th January 1967. Commercial Complex built and rented out to Canara Bank and other establishments. Samaja gets a site allotted for starting a school in Indiranagar, during Chief Ministerial tenure of Shri R.Gundu Rao, who hailed from coorg district. Samaja establishes Cauvery School in Indiranagar with just about 40 students. New Dining Hall was added to the Community Hall in vasanthanagar. Kodava Samaja Sports and Recreation Club comes into being under the samaja. High School section comes into existence at Cauvery School in Indiranagar. Old community Hall built in 1967 dismantled, in order to build a New Modern Community Hall. New Community Hall work in progress. Many kodavas make liberal donations towards the construction of the community hall. (1)New Community Hall built at a cost of one Crore Rupees inaugurated and named after Field Marshall K.M.Cariappa. (2) A site purchased in Kodihalli for construction of College building. (1) Cauvery College with PUC and Degree courses comes into being in Indiranagar. (2)The kodava Samaja Sports and Recreation club initiates F.M.Cariappa State Level Hockey Tournament. Grand Kodava Mela jointly organized by Bangalore Kodava Samaja and Kodava Sahitya Academy, Madikeri. Over 30,000 Kodavas take part in the Mela. Old dining hall area renovated. General Thimmaiah Hall and club house with rooms constructed. (1) Medical Welfare Fund Scheme launched by the samaja. (2) Initiation of Inter-sangha Cultural competitions and celebration of Field Marshall K.M.Cariappas birthday on January 28th every year. (1) Renovation of first and second floor above General Thimmaiah Hall and adding of Cauvery Hall for the conduct of small functions. (2) Initiation of Inter-sangha Hockey Tournament. (1) Fabrication of Haridasa Appaneravenda Appachu Kavi Sabangan in the vacant place behind and laying of Badminton court. (2) Kodava Samaja Education Fund Refurbished. (3) Initiation of Inter-sangha shuttle Badminton tournament. (2) Establishment of Cauvery Souhardha Co-operative Society under the samaja. Initiation of Free Medical Health check up camp for all kodavas. Launching of Samaja News Letter Pombolak in kodava language. Completion of the construction of College Building at Kodihalli (HAL II Stage) Shifting of Cauvery College from Indiranagar to kodihalli. (1) Fabrication of Roof Garden on the top of the club premises for small parties and get-togethers. (2) Installation of Lift facility in the Thimmaiah Hall building. Facelift given to all the facilities and structures in the Kodava samaja premises. (1)The samaja celebrated its centenary year in the month of November in a grand scale. The governing council constitutes various committees and sub committees for the purpose. Centenary Logo released on 28th January 2011, coinciding with 112th Birthday celebrations of Field Marshall Late Kodandera.M.Cariappa. (2)A new branch of Cauvery School opened in the premises of Dasarahalli Kodava Sanga, Bangalore. (3) The Samaja pursues with the Government of Karnataka to grant five acres of land at Yelahanka to the samaja, for the purpose of establishing an old age home, hospital, School, community hall and provide other facilities to the Kodava community. It can be observed from the above facts that Bangalore Kodava samaja is involved in one or the other activity, since its inception in the year 1911. Its activities are so varied, that it touches almost every aspect of life of a kodava of Bangalore, ranging from health care to education and sports to culture. It is doing everything possible for the welfare and wellbeing of the kodava community. Bangalore Kodava Samaja is not only a Model Samaja for other Kodava Samajas, but it is a Model Community Association for the entire state of Karnataka. The Samajas practice of lending its Community Hall and other Small Halls with best of the facilities to the members for marriages and other small functions, at a very nominal rent, is great service to the kodava community. Its another practice of granting a financial relief of Rs 10,000/- to the legal heirs of the deceased member, through the Death Fund is very unique and unprecedented. 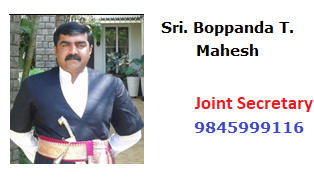 The kodava samaja of Bangalore is like an Ayaan Maane for about 40,000 kodavas of Bangalore. It has become a common meeting place for the kodavas from different parts of Bangalore. Bangalore Kodava samaja earlier called as Coorg Association, which had just about 30 members in the year 1911, today has 10,000 plus registered members. The assets of the samaja are worth more than one hundred crores of rupees. The annual financial turnover of the samaja is about six crores. It is really unbelievable to accept the fact, that a small kodava samaja which started its activities by collecting a membership fee of just fifty paisa from members, during the early 1950s and 60s, has become such a big and successful community association. The Samajas Management style is very democratic. The elected office bearers of the samaja are supported by many committees and sub committees. A total number of 300 members are a part of the kodava samaja governing council. The 32 Kodava sanghas of Bangalore have further strengthened the roots of the Bangalore Kodava Samaja. 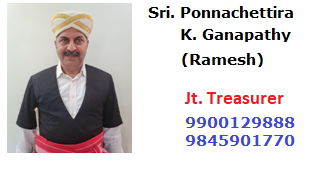 Bangalore Kodava Samaja has emerged as an Elder Brother to all the other area kodava sanghas. Many kodavas have toiled hard under very difficult conditions in the past for bringing the samaja to this present stage. Their hard work and sacrifices are to be remembered for ever. An effort must be made to record all the efforts and services of the past office bearers, committee members and other karyakarthas. In future some new facility or at least the new college building in kodihalli should be named after shri Kodanda Nanjappa and shri Kodanda Machaiah for their splendid efforts in the formation of Coorg Association, during very difficult times. 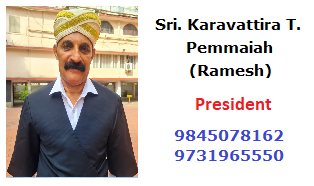 The immediate task before the new office bearers of the Bangalore Kodava Samaja is to organize a Grand Centenary Celebration, and remember all the people who have toiled selflessly for the progress of the Samaja.The samaja must also make use of this occasion to showcase the rich kodava culture and traditions to the entire nation and the world.